Once known as a major commercial hub in ancient India for trading activities with the Greeks and Romans, Velankanni soon lost its importance to the nearby and larger city of Nagapattinam. 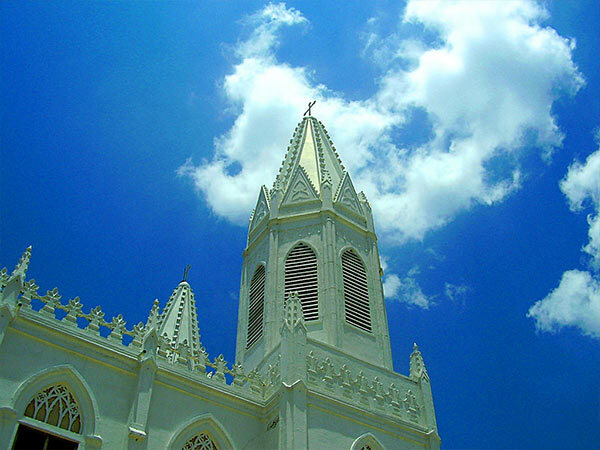 Reminiscent of the glorious cultural mixes that existed during the advent of Christianity to India, Velankanni still hosts some of the massive glorious churches standing amidst pristine palm trees; it hosts their annual festivals that see thousands of people gathering in this silent town from all around the world. Visiting Velankanni offers you a major refuge from your otherwise busy daily schedule and brings you the best of nature and history. Velankanni is located in the Nagapattinam district of Tamil Nadu. It is nestled in the Coromandel Coast of Bay of Bengal and lies approximately 350 km south of Chennai. From Chennai, both rail and road travel is available but accessing the route via road is better and there are three ways to hit Velankanni via road. The advised route is through the East Coast Road as the road is wide with less traffic and offers splendid views of the coastline. It also hosts many sightseeing and tourist spots all along the way. The East Coast route to Velankanni has some major spots on the way, which are rejuvenating and offer a calm refuge from your daily city workload. With places like Mahabalipuram, Pondicherry and other famous sites lying on the way, you are sure to have a wonderful and memorable trip. The route is also advised for bikers as the roads are nestled between the laps of nature along with well-crafted facilities for fuel and food. The trip should be planned during the months of October to March when the climate is cool and mild, thus, avoiding the sultry and humid climate of Tamil Nadu during summers. Late August to mid-September sees a major flock of tourists for the annual festival, which attracts a large number of pilgrims. Summer months are crowded due to the holiday season. Your journey via the East Coast Road will have Mahabalipuram as your first halt. It lies approximately 60 km from Chennai. Mahabalipuram is known for its ancient Shore Temple, the five Rathas and the Tiger Cave, which are well preserved and stand as ancient marvels displaying the epitome of building art with granite and monolithic stones. The Sadras Beach that lies on your route is a must-visit. It has a beautiful landscape beset by luscious green Casuarinas groves. Do not forget to stuff your stomach with the seafood available before hitting the road. The grilled calamari is a brilliant dish consisting of bread and marinated squids. Located at a distance of 100 km from Mahabalipuram lies the erstwhile French territory of Puducherry. The ancient city has marvellous Gothic art buildings like the Basilica of Sacred Heart and the Jesuit Immaculate Conception Church, which draw French influences. Puducherry is also famous for water sports and scuba diving. Local restaurants in Puducherry serve you mouth-watering French dishes like coq au vin and bouillabaisse. Cuddalore is just 20 km from Puducherry and hosts the famous Devanathaswamy Temple dedicated to Lord Vishnu. You can refuel your vehicle here and hit the Pichavaram Lake, which houses dense mangroves in the shallow delta of the Eastern Ghats. However, if you are falling short on time, then avoid the boat ride. The next stop at Chidambaram is just 45 km from Cuddalore. Chidambaram is an ancient temple city of the Pallava dynasty and is known for its paddy fields, architecture and chilli and pepper cultivation. The famous Nataraja Temple and the thousand-pillar mandapam is located here. Sightseeing on the East Coast Road is at its peak while passing from Chidambaram. The clear pristine fields of paddy and the village settlements along the road are no less than therapeutic. About 110 km from Chidambaram lies Karaikal, which is also an ancient French settlement and a modern Hindu pilgrimage site. A short visit to Saneeswara Temple and Our Lady of Angels church is advised on the way. Located at a distance of 30 km from Karaikal, Velankanni is your final stop. The town is located on the banks of Valayar branch of the Cauvery river and is one of the most visited Roman Catholic shrines, attracting millions of tourists around the year. The 16th-century massive Gothic church was built on many miracles, including the one which carries the story of a surviving Portuguese man on the beach. The sacred pilgrimage site sits upright, nestled amongst the palm trees and a sea beach nearby. It hosts the Feast of Nativity of Mary festival in September annually. The church is believed to be the place where Mother Mary once appeared. There is a tank located in front of the church, which is believed to be created by Mother Mary. There are no altars on the church and a depiction of Mother Mary and the milk boy is well crafted on the walls here. The place has a silent surrounding and quenches the spiritual thirst of people who visit here. The beach is near the basilica and is known for its sunset, spicy seafood and a wide shore. A walk around the beach during the evening offers a beautiful red-lit sunset of the sea, illuminating the church and fields nearby. Handloom and silk manufacturing is a major industry in the villages nearby and traders flock to the market to sell their produce. Silk is of superior quality and is well known all around for its beautiful ethic clothing.